Perdana ParkCity Sdn Bhd expects to rake in sales of RM600 million for the year to December 31 2010, its highest since it was set up 10 years ago, group chief executive officer Lee Liam Chye said. "For the first time we are going to launch more than RM500 million worth of products in Desa ParkCity. We are confident of sales as we have a lot of registrations from repeat buyers," Lee said. The company is launching 338 units of condominiums for some RM260 million and 147 units of two- and three-storey terraced houses, worth around RM300 million in June and July, respectively. Perdana ParkCity was set up in 1990 as a subsidiary of Samling Group to venture into property development. Its flagship project is Desa ParkCity in Bukit Menjalara. Sarawak-based Samling Group is controlled by tycoon Datuk Yaw Teck Seng. It is one of the biggest logging companies in Malaysia with some 1.5 million ha of forests in Sarawak. The development of Desa ParkCity on 190ha started in June 2002. The land, formerly a site for a quarry, was bought from SPK Group in 2000 for around RM200 million. It took the company three-and-a-half-years to form the site by blasting granite rocks. "It was a very hostile site for development. There were 12.5 million cu m of material, where 75 per cent were rocks. "We had to spend RM100 million upfront to form the site. It would have cost us more than RM200 million but we had two crushing plants to process the rocks, which were of commercial value and sold that in the market to lower the cost," Lee said. Land clearing was clearly a drag on the project, which was planned for completion in 2012. "It slowed us down a lot. Once we passed through that phase, we were able to ramp up. We are now targeting to complete by 2015," Lee said. 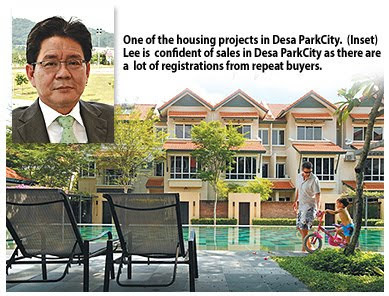 Lee, who has more than 20 years of experience in property consulting and development has been involved in Desa ParkCity since 1999. "Master planning the 190ha was not easy but I knew how to. We just had to do a lot of research and the fundamentals of what people wanted was quite clear," Lee said. "It was tough as we had to plan 25 neighbourhoods and the concepts were different. But I think today, we made the right judgement call," he said. PERDANA ParkCity Sdn Bhd will launch RM600 million worth of properties a year at its Desa ParkCity township in Bukit Menjalara, Kuala Lumpur, to complete the project by 2015. Group chief executive officer Lee Liam Chye said it is planning the launch of 5,000 homes over the next six years, mostly condominiums in 12 neighbourhoods, worth more than RM3.5 billion. The Samling Group's subsidiary is optimistic of the market. "Since the launch of the first neighbourhood in 2005, the price of properties have more than doubled, surpassing the value of terraced houses in Bangsar, Bandar Utama and Taman Tun Dr Ismail," he told Business Times during a visit to the project. "The terraced houses here are worth more than RM1 million each currently. Despite the depressed market last year people were making around 65 per cent profit selling their properties in the secondary market," Lee said. Desa ParkCity aims to offer a lively, safe and vibrant community. Each neighbourhood has its own concept, is gated and fully landscaped. Once completed, Desa ParkCity will have 7,278 residences in 25 neighbourhoods with a population of 35,000 people. The completed township will include a 18ha mixed-use commercial belt, a 17ha central park, a RM60 million clubhouse, local and international schools, a neighbourhood mall and a private hospital operated by Sime Darby Bhd. "Most of our buyers are repeat customers and they believe in our product value. I am very critical about bad designs and carelessness. We owe our customers a duty to make sure we give them the best so they speak good about us," Lee said. On the new products this year, the company will launch 338 units of condominiums for some RM260 million or more than RM450,000 each in June. It will launch "Casaman" in July. According to Lee, Casaman will be the last batch of terraced houses at Desa ParkCity, featuring 147 units of 2 and 3 storey terraced houses, worth RM300 million. The intermediate 2 storey and 3 storey houses are each priced from RM1.5 million and RM2 million. Mah Sing Group Bhd is actively scouting for more land to meet market demand for its award winning property products. The comany is boosting its business development activities to reach owners of land with good development potential for outright sales or joint ventures. The lifestyle developer is also keen to participate in the government’s tender process for land to be developed by the private sector. Its Group Managing Director and Group Chief Executive Tan Sri Leong Hoy Kum said: "We are interested in niche land in Kuala Lumpur’s Golden Triangle as well as the larger suburban property, suitable for township development, like the new 3,000-acre Klang Valley hub in Sungai Buluh. "We are confident of adding value to the land and contribute positively by capitalising on our vast exposure, experience and success in property development as well as sound financial standing." Mah Sing is one of the most aggressive developers on the local front and has consistently delivered good earnings with a strong compounded annual growth rate of 51 per cent from 2002 to 2009. That, as well as a generous policy of paying out a minimum of 40 per cent of its net profit as dividend, has attracted prominent shareholders including Permodalan Nasional Bhd, Koperasi Permodalan Felda Bhd and the Employees Provident Fund. The Group is committed to continuously protect and enhance shareholders’ value by capitalising on opportunities, be they land acquisitions from both the government and private sector, joint ventures or reviving distressed assets. The Group has 16 years of property development expertise, and is a fully integrated developer. Mah Sing’s platter of 25 quality residential projects, prime commercial projects and innovative industrial projects, is focused on the medium to high end property segments in Malaysia. Its forte is in developing award winning projects with good concepts in Kuala Lumpur, Klang Valley, Penang island and Johor Bahru. Leong said Mah Sing is very committed to delivering products that suit buyers’ needs in terms of designs, concepts, quality and value. Mah Sing’s projects are lifestyle offerings featuring good security, to ensure that is lifts the quality of life for buyers. This can be seen in the recognition from the public, investors and professional bodies, which have supported and helped it win 25 awards for both projects as well as corporate performance, since the Group ventured into property development. The Group received four awards at the Asia Pacific International Property Awards 2010 in Hong Kong on last Friday night. This is the largest number of awards to be won by a single Malaysian developer this year. 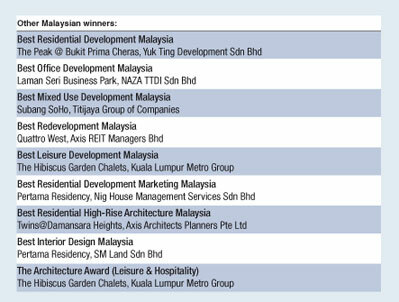 Mah Sing Group was recognised for both residential and commercial properties, winning 5-Star Awards for Best Property (One Legenda,Cheras) and Best Architecture (Legenda@Southbay, Penang island), as well as the Highly Commended Award for the Grade A office, The Icon Jalan Tun Razak, in the Best Office Development category. The exclusive bungalow project, One Legenda also had the distinction of being named Best Property Asia Pacific, and will represent Malaysia at the world level. Mah Sing is also the first Malaysian company to be internationally nominated for the Best Property category. The Asia Pacific International Property Awards 2010, established 16 years ago, seeks out the best real estate professionals across the globe. Speaking proudly of the wins, Leong said: "Receiving awards at the regional level and to represent Malaysia and the Asia Pacific region on the global stage, reaffirms our status as a premier lifestyle developer. "These awards have not only given us recognition but also encouragement to perform better," he said. Moving forward, the Group will adopt the strategy of continuing its niche, quick turnaround development model for residential, commercial as well as industrial sectors, as it is profitable and cash generative. The company intends to look for large landbank for a potential mass housing project and continue to explore overseas expansion to complement the Malaysian expansion. Meanwhile, Sunrise Bhd's 28 Mont'Kiara project was named the Best Residential High-Rise Development in the Asia-Pacific. Dijaya managing director Datuk Tong Kien Onn said: "We are honoured to win the award and we attribute this success to all employees of Dijaya for their passion, dedication as well as the trust which our customers have in our company." Last week the State Council raised the minimum down payment for second home purchases to 50 percent and set a minimum 30 percent deposit on first homes bigger than 90 square metres (970 square feet). China is trying various ways to prevent the growth of asset bubbles as the nation's economy surges -- it grew 11.9 percent in the further three months of the year -- and keep a lid on inflation. Beijing has been clamping down on bank lending which has been blamed for fuelling speculative investment in the property sector. Policymakers have raised bank reserve ratios twice this year -- effectively limiting the amount banks can lend -- and increased interest rates on benchmark three-month and one-year Treasury bills. Property developer Bolton Bhd has bought out a joint-venture firm involved in the ongoing development of Taman Tasik Prima, a residential and commercial project in Puchong, Selangor, for RM28 million. Bolton initially owned 50 per cent less one share in the JV company, Prima Nova Harta Development Sdn Bhd, which is known for the middle to high-end lake-front houses on the 138ha site in Puchong. The purchase will have a positive impact on the earnings of Bolton for the financial year ending 31 March 2011 and in the future, Bolton told the stock exchange yesterday. The deal will be financed with the company's own fund and is not expected to have an impact on its gearing, Bolton said. PETALING JAYA: YTL Corp Bhd is acquiring the remaining shares in YTL Pacific Star REIT Management Holdings Pte Ltd for S$40mil from Pacific Star REIT Management Holdings Ltd. The company told Bursa Malaysia yesterday that the acquisition would involve 1.5 million ordinary shares and two class C redeemable preference shares. It said the acquisition would be completed in two tranches – 750,000 ordinary shares and one class C redeemable preference share upon settlement of a sum of S$17.5mil. The remaining stake will be transferred to YTL upon settlement of S$22.5mil on a date falling 24 months from the date of the agreement.